The institute, which the UT System Board of Regents established in August 2014, will be giving up to a total $5 million to applicants in an attempt to enhance brain research, according to a statement from the UT System. The seed grants, which are grants that go toward approved projects, will fund innovative brain research projects, according to institute director Daniel Johnston. Johnston said he is expecting around 200 applications from UT System institutions. “The purpose of the seed grants is to allow researchers to pursue new high-risk areas of research and to form new collaborations with other scientists that might not have occurred without the seed funding,” Johnston said. Patricia Hurn, UT System vice chancellor for research and innovation, said the institute, also known as UT Brain, will benefit from the seed grants because the researchers will be in a better position to receive federal funding. Because of decreased federal funding for neuroscience research, there will be increased national competition, according to mechanical engineering professor Dale Klein. Although the seed grants will only be available for UT System schools, they are intended to garner competition for federal grants. UT-Austin will be administering the grants in a partnership with the UT System. Applicants for the seed grants will come from departments and faculties from across the state, Klein said. President Barack Obama announced the launch of the BRAIN Initiative in April 2014. The initiative is “focused on revolutionizing our understanding of the human brain,” according to a White House statement. The UT Neuroscience and Neurotechnology Institute was founded to foster collaboration among researchers, according to Klein. “It really is intended to enhance communication among the faculty at both the academic and the medical health-science institutes to help focus on research needs,” Klein said. Cigarroa: "I knew the day would come when I would return to transplant surgery." UT System Chancellor Francisco Cigarroa, who has served in the position since 2009, will resign at a specially called press conference Monday. Cigarroa will stay in his current role until a replacement is found, after which he will become head of the pediatric transplant team at the UT-Health Science Center at San Antonio. In an email he sent to UT System employees late Sunday evening, Cigarroa explained his decision to step down and said he was ready to take the new opportunity, which was initially offered to him in late 2013. Cigarroa said he felt proud of the goals the System has achieved during his tenure as chancellor over the course of the last four years. Cigarroa has been a key figure in ongoing tensions between President William Powers Jr. and members of the regents over the course of the last several years. At the board’s December meeting, where the board discussed Powers’ employment, Cigarroa recommended Powers remain president but also issued a strong warning to Powers to “improve relationships” with the UT System. Cigarroa said Powers had made public statements misrepresenting the relationship between the University and the System even in times when there was no conflict. “The main reason for the strain is that [Powers] and I would agree on certain principles, and then I would act on those principles, but then [Powers] would often convey a message of misalignment,” Cigarroa said at the meeting. After the decision, Powers said he was thankful for Cigarroa’s continued support. According to Cigarroa, his decision to step down is largely based on his feelings for his communities, the UT System and his own family. Cigarroa will be returning to where he began his career at the UT System, as he served as director of pediatric surgery at UTHSC-San Antonio from 1995-2000 and served as president from 2000-2009. In 2009, he was named chancellor of the System by the Board of Regents. Two years ago, Cigarroa told The Daily Texan he originally planned to return to practicing surgery full-time after his tenure as president expired but changed his mind when the chancellor position opened up. Cigarroa has four other siblings who practice medicine. Cigarroa will make his announcement at 11 a.m. at Ashbel Smith Hall. As the tense relationship between UT and the UT System continues, the UT System Board of Regents reshuffled its leadership in its meeting Thursday. The board elected Regent Paul Foster as chairman, while naming former Chairman Gene Powell and Regent Steve Hicks as the board’s vice chairmen going forward. The change comes in the wake of accusations by state legislators that the regents have been conspiring to oust President William Powers Jr.
After the meeting, Foster said he hoped to move past the controversy and affirmed his support for Powers. The University has had a particularly difficult relationship with the regents since 2011, when some regents sought to make significant changes to UT’s curriculum, according to student leaders. Tensions have also been high among some students and faculty, who claim regent actions have been too intrusive. University-affiliated external foundations, which raise funds for the University with little oversight from administrators, became a point of contention after it came to light that former UT School of Law Dean Lawrence Sager received a $500,000 forgivable loan from the UT Law School Foundation in 2011. Sager later resigned at Powers’ request. Powers said he was not aware of the loan at the time, although Regent Wallace Hall accused Powers of knowing about its existence. The regents formed the Advisory Task Force on Best Practices Regarding University-Affiliated Foundation Relationships to create guidelines for relationships between foundations and system institutions. The task force presented its final report at last week’s board meeting and will release its final written report this week. Hall is now being investigated by the House Select Committee on Transparency in State Agency Operations, which met multiple times over the summer as part of the investigation. At the committee’s July 29 meeting, Co-Chair Dan Flynn, R-Canton, said Hall would likely be one of the first witnesses called to testify before the transparency committee at future hearings. The committee has stated that it would begin holding the hearings in late August or September. On Friday, the committee hired Houston attorney Rusty Hardin as its special counsel for the investigation. If impeached, Hall would be the first state appointee to be impeached in state history. In cooperation with the investigation, UT decided to cancel and suspend all open records requests from the UT System, including any requests made by Hall. At last week’s meeting, the board approved a compliance review regarding the Texas Public Information Act, to ensure the system administration, UT and two other system institutions are in line with the law. In a letter sent to the transparency committee co-chairs Thursday, Stephen Ryan, Hall’s attorney, defended Hall’s actions and claimed Hall has evidence that two state legislators inappropriately influenced UT officials to accept two students to the University. While the investigation into Hall continues, the regents’ decision to invest $10 million into MyEdu in 2011 has also come under criticism over the summer from former student leaders as the company continues to expand its website to offer career services to students. At the board’s July meeting, MyEdu Chairman and CEO Michael Crosno explained the changes in a presentation to the regents on its move to include career services on its website. The company also made changes to its professor review system by removing negative reviews from students as well as its star-rating system. However, in July, Michael Morton, former president of Senate of College Councils who served on UT’s MyEdu steering committee, raised concerns about the system’s partnership with MyEdu. While the House Transparency Committee’s investigation into Hall will continue into the fall, electing Foster as chairman might be one of the last acts of the regents for a while, as they are not scheduled to meet again until mid-November. Steven Leslie, UT’s executive vice president and outgoing provost praised the new chairman and his plan to move forward. “I’m confident that he’s going to be a powerful leader of the University of Texas System as our new chairman, and I think the University of Texas at Austin will advance strongly under his leadership,” Leslie said. MyEdu CEO Michael Crosno and Vice President Deepak Surana present to the UT System's Board of Regents in July. MyEdu claims students support changes made by the company in the past year, but former student leaders doubt the changes are beneficial or worth the $10 million the UT System invested in the company. At the UT System regents meeting earlier this month, MyEdu showcased new features providing career services to the company’s website. MyEdu executives cited student satisfaction in their short presentation, which elicited few comments from the regents, but the company’s new career services options may not be the best direction for students, said Michael Morton, former Senate of College Councils president and UT alumnus. "I haven’t really been impressed with MyEdu and their communication with students on what exactly they’ve changed in their product," Morton said. "There’s a long way to go in order for MyEdu to be an effective company." In October, MyEdu began offering career services on its website, as well as a “student profile” service. In an interview with The Daily Texan, Frank Lyman, chief product officer at MyEdu, said the profile gives students a place to showcase their skills to employers. The partnership between UT and MyEdu began in 2011, when the UT System made a $10 million investment into MyEdu, a website that helps college students select their courses and professors online. John Cunningham, one of the company’s founders, is the son of former UT-Austin President and UT System Chancellor William Cunningham. The UT System Board of Regents were aware of the connection when the investment was made. However, Morton and former Student Government President Thor Lund both said they were concerned with MyEdu’s new focus on connecting students with employers. While in office, Lund and Morton were the only student members on UT’s MyEdu steering committee. The committee, also made up of faculty and staff members, meets with MyEdu representatives every month during the regular semesters to discuss ideas and issues with the company’s product. Lund said MyEdu’s job matching service is not the best place for UT students to find jobs. Lund pointed out that there are already Career Services offices and job fairs offered on campus. Not all members of the steering committee share these concerns. Brad Englert, UT chief information officer and head of the steering committee, said students can choose not to use MyEdu if they do not want to use the service. Englert said more than 90 percent of UT-Austin students have a MyEdu account. The company also made changes to its professor review feature. Previously, the website allowed students to write both positive and negative reviews of professors and rate them on a five-star scale. According to Lyman, MyEdu removed the negative reviews and star-ratings as part of the company’s decision to move to an objective review method. Lyman said the site now offers questionnaires about professors’ classes. However, Lund said the company’s previous professor review system better served UT students. Michael Redding, former Graduate Student Assembly president, also expressed his frustrations with the company. Redding said while serving as GSA president, his attempts to contact MyEdu representatives about expanding the company’s services to graduate students were unsuccessful. “My impression was that they weren’t very responsive when it came to working with students,” Redding said. In a March letter to Rep. Roberto Alonzo, R-Dallas, Redding called the company an “unproven system.” Shortly after, he received an email from MyEdu CEO Michael Crosno regarding his comments. Redding shared the email exchange with The Daily Texan. According to Crosno’s email, Crosno discussed Redding’s comments with UT Provost Steven Leslie. “That was something that I’ve never seen before: The CEO of a company calling me out for calling his company out,” Redding said. Lyman said Crosno always takes an interest with any student public opinion on MyEdu. “In this case he reached out to Michael Redding to invite him to lunch and try and better understand his thoughts on MyEdu,” Lyman said. Redding and Crosno were unable to schedule a meeting with each other. Responding to Lund, Morton and Redding, Lyman cited a MyEdu survey that found 96 percent of UT students surveyed expressed satisfaction with the company’s product. “That suggests to me that most students are really pleased with what we are doing,” Lyman said. The Commission of 125 set the tone for the last nine years of progress at the University and UT has recently drawn attention from UT System regents and former commission members on its progress toward fulfilling the commission’s goals. After three regents criticized the University’s work on benchmarks set by the Commission of 125 during a heated meeting in February, UT President William Powers Jr. received an outpouring of support from the Legislature. Since February, regents and state legislators have exchanged criticisms, both under the Capitol dome and in editorials. Last week, four regents voted to call a special meeting Thursday to discuss new developments between the board and the Legislature. The commission, composed of 218 outside executives, alumni and philanthropists, issued 16 recommendations in 2004 for how the University could best serve Texas in the long term. Former UT President Larry Faulkner initiated the commission and asked its members for proposals to restructure University operations and revise the undergraduate core curriculum. Since Powers succeeded Faulkner as president in 2006, many of his initiatives have revolved around the commission, including revisions of the undergraduate core curriculum, reorganization of administrative services and projects including the School of Undergraduate Studies and the Student Activity Center. One former commission member, Melinda Perrin, said she was surprised how the three regents spoke of Powers in February. Perrin said Powers is “like a sheriff” who has improved the University through his initiatives for undergraduates. Perrin also said state funding, tuition rates and other factors beyond Powers’ control have limited UT’s flexibility. “You don’t have total alignment between governance and administration priorities,” Perrin said. She is former chairwoman of the University Development Board and is now active in the Texas Coalition for Excellence in Higher Education. Charles Tate, a commission member and board member of Capital Royalty LP, said the University has made significant progress improving its administration structure, and that cherry-picking a few of the recommendations is not fair to those working to improve UT. However, proposals for additional on-campus housing for students, raising graduation rates and reducing the undergraduate student-faculty ratio have not met the benchmarks set by the commission. 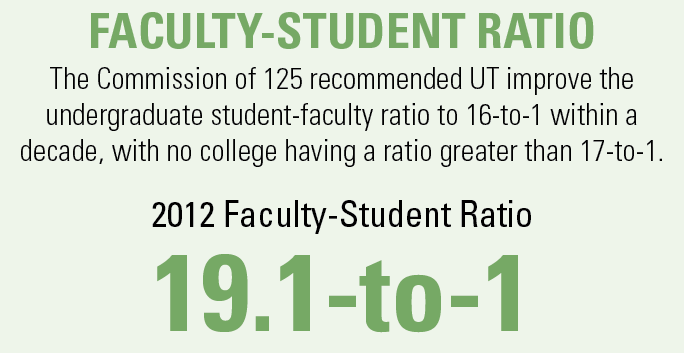 The Commission of 125 recommended UT improve the student-faculty ratio to 16-to-1 by 2014 from 21-to-1 in 2004, but the undergraduate student-faculty ratio has only improved to 19-to-1. Kenny Jastrow, chair of the Commission of 125 and former CEO of Temple-Inland Inc., an Austin-based paper, building products and financial services company, said changes in classroom technology since 2004 may require the University to retool its application of the Commission’s recommendations. The University now has several initiatives for professors to make their classrooms more interactive through the Center for Teaching and Learning. The UT System partnered with edX last semester to create services that automate routine classroom functions such as grading and daily assignments. In an interview with The Daily Texan, Powers said years of budget cuts from the state Legislature altered the goals of the University for the student-faculty ratio. The Commission of 125 recommended the University increase its four-year graduation rates. Last year, the Task Force on Undergraduate Graduation Rates proposed that UT raise four-year graduation rates to 70 percent by 2016. Four-year graduation rates have risen from 41.7 percent to 51 percent in the past nine years. Many traditionally underrepresented groups, including first-generation students, have been admitted to UT through the Top 10 Percent Law, which automatically admits the top 10 percent of graduating seniors to Texas public universities. Nearly 26 percent of all students admitted under Top 10 did not have parents with a college degree, while 10 percent of non-Top 10 admits did not have parents with a college degree. Also increasing are Hispanic enrollments. 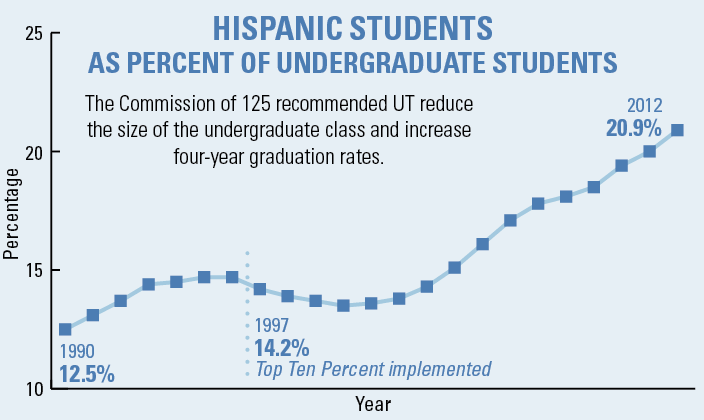 From 2004 to 2012, Hispanics increased their representation at UT from 15.1 percent to 20.9 percent. According to research published last year by the department of African and African Diaspora Studies, Hispanic students from largely Hispanic high schools are more likely to be admitted under Top 10 because they are admitted based on class rankings rather than other factors that may have not qualified these students for admission. For the class of 2008, the University-wide four-year graduation rate was 52 percent, compared to 39 percent for first-generation college students and 41 percent for Hispanic students, according to the Task Force on Undergraduate Graduation Rates. As the University strives to meet the recommendations of the commission, its obligations to students admitted under Top 10 may pose a dilemma for the limited resources available to the Forty Acres, said Perrin. Among many factors that affect four-year graduation rates is providing remediation to students who are not college-ready upon admission, Perrin said. “Remediation does interfere with streamlined graduation tracking, because if you’re not coming to campus college-ready then the University is going to have to play catch-up,” Perrin said. Tate, a former commission member, said he believes the obligations placed on the University by Top 10 harm its ability to build a diverse student body because Top 10 only uses grades as a factor. One new UT initiative is to end remediation for incoming UT students by offering dual-credit classes aligned with UT-Austin benchmarks for college level reading and mathematics. The pilot program will begin this fall with some Texas students taking pre-calculus, said Harrison Keller, vice provost for higher education policy and research. One unmet goal set by the Commission of 125 was to increase the available housing on campus from 6,396 to 9,000 beds. 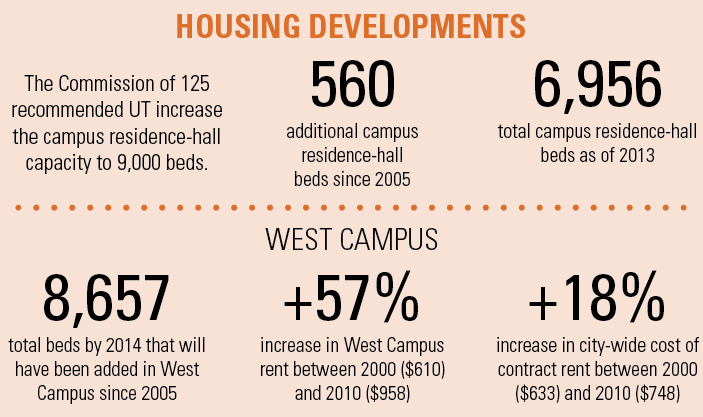 By 2014, 8,657 beds will have been added in West Campus by private developers since 2005, according to the West Campus neighborhood association. Only 560 beds have been added on campus since 2005, bringing the total number of beds on campus to 6,956. The commission found that living close to campus increases graduation rates. Developer interests and changes to zoning meant the cost of new West Campus housing quickly rose beyond what many students can afford. The median cost of contract rent in West Campus rose from $610 in 2000 to $958 in 2010, a 57 percent increase, census records show. The citywide cost of contract rent rose from $633 to $748 in the same time period, an 18 percent increase. In an interview last September with The Daily Texan, West Campus developer Michael McHone said the University was involved in discussions that created today’s West Campus. McHone said UT benefited from the new housing by allowing students to develop closer ties to the University and become more likely to donate UT after they graduate. Randall Porter, director of residential facilities, said the University decided to wait to construct new housing on campus because of direct competition with West Campus housing. However, Porter said the University is now conducting a Residence Hall Needs Assessment, to be finished May 1, to determine the University’s need and ability to create more on-campus housing. “With the recent campus four-year graduation initiative and the emphasis on student life to help facilitate student success, we decided to test the market to see if it is time to construct more on-campus housing,” Porter said. In a statement last Fall, UT spokesman Gary Susswein said the University did not have the financial resources to build its own housing dormitories on campus because of budget cuts from the state Legislature.